Located in Buleleng, this beachfront hotel is connected to a shopping center, 0.1 mi (0.1 km) from Lovina Beach, and 2.6 mi (4.1 km) from Krisna Funtastic Land. Puri Jati Beach and Banjar Hot Springs are also within 9 mi (15 km). 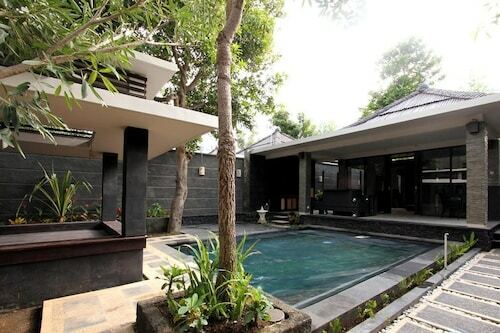 Situated in Buleleng, this spa villa is 0.1 mi (0.1 km) from Lovina Beach and 2.8 mi (4.4 km) from Krisna Funtastic Land. Brahma Vihara Arama and Banjar Hot Springs are also within 9 mi (15 km). Situated in Buleleng, this hotel is 0.1 mi (0.1 km) from Lovina Beach and 2.7 mi (4.4 km) from Krisna Funtastic Land. Brahma Vihara Arama and Banjar Hot Springs are also within 9 mi (15 km). Situated in Buleleng, this bed & breakfast is 0.1 mi (0.1 km) from Lovina Beach and 2.5 mi (4 km) from Krisna Funtastic Land. Brahma Vihara Arama and Banjar Hot Springs are also within 9 mi (15 km). 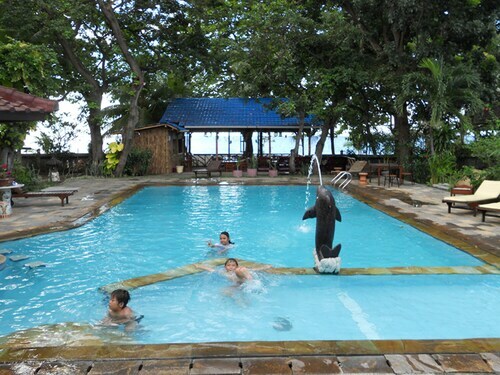 Nestled on the beach, this Buleleng hotel is 0.1 mi (0.1 km) from Lovina Beach and 2.5 mi (4 km) from Krisna Funtastic Land. Banjar Hot Springs and Brahma Vihara Arama are also within 6 mi (10 km). Located in the heart of Buleleng, this spa hostel is 0.1 mi (0.2 km) from Lovina Beach and within 9 mi (15 km) of Brahma Vihara Arama and Banjar Hot Springs. Gitgit Waterfall is 11.3 mi (18.1 km) away. 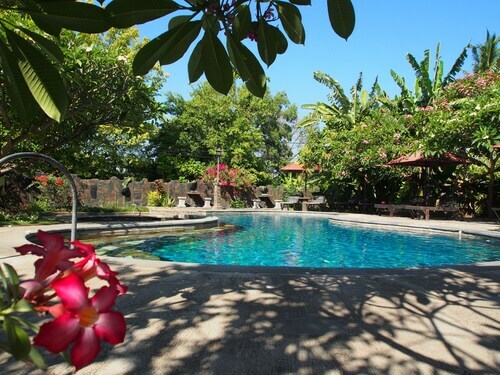 Situated in Buleleng, this bed & breakfast is 0.2 mi (0.3 km) from Lovina Beach and within 9 mi (15 km) of Banjar Hot Springs and Aling-Aling Waterfall. Gitgit Waterfall and Munduk Waterfall are also within 16 mi (25 km). 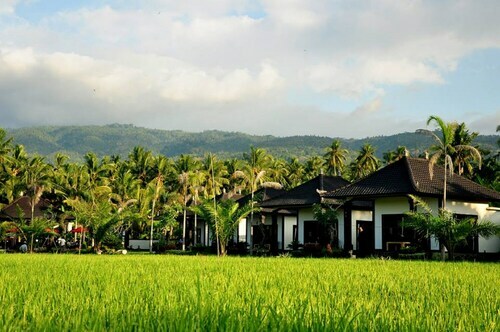 Nestled on the beach, this Buleleng hotel is 0.1 mi (0.1 km) from Lovina Beach and 2.9 mi (4.6 km) from Krisna Funtastic Land. Puri Jati Beach and Banjar Hot Springs are also within 9 mi (15 km). 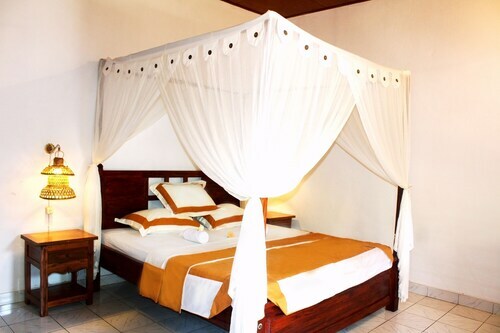 Situated in Buleleng, this bed & breakfast is 0.1 mi (0.1 km) from Lovina Beach and 3 mi (4.8 km) from Krisna Funtastic Land. Gedong Kertya Museum and Library and Museum Buleleng are also within 9 mi (15 km). 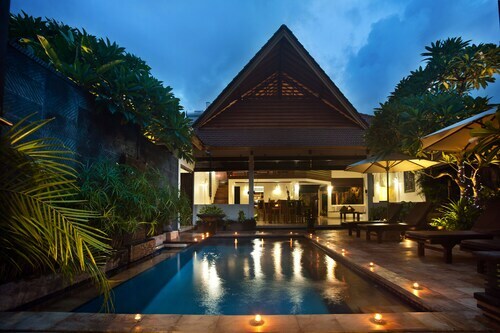 Situated in Buleleng, this villa is 0.2 mi (0.3 km) from Lovina Beach and 3.1 mi (5 km) from Krisna Funtastic Land. Gedong Kertya Museum and Library and Museum Buleleng are also within 9 mi (15 km). 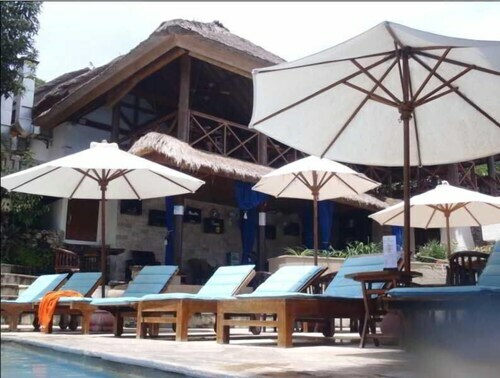 Situated near the beach, this hotel is 0.3 mi (0.5 km) from Lovina Beach and 2.8 mi (4.4 km) from Krisna Funtastic Land. Brahma Vihara Arama and Banjar Hot Springs are also within 9 mi (15 km). This family-friendly Buleleng resort is located near the beach, within 3 mi (5 km) of Lovina Beach and Krisna Funtastic Land. Puri Jati Beach and Banjar Hot Springs are also within 9 mi (15 km). Lovina Beach is just one of those excellent places that you really ought to see at least once. It doesn't matter if it's your first trip to Buleleng or you've visited before, there are always new things to see. 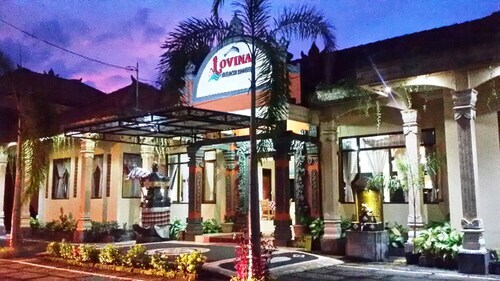 Book a room at one of the 33 accommodation options within an easy commute of Lovina Beach. Try The Damai (3 kilometres). That said, The Lovina (a kilometre) and the Gino Feruci Villa Lovina (0.3 kilometres) are also popular. If you'd rather be exploring the area, then why pay hand over fist for a place to stay? Fortunately, there are some bargain options close by. Two choices are the Aditya Beach Resort and the Santhika B&B, 0.8 kilometres and 0.9 kilometres away, respectively. That said, this area's numerous upscale, luxury hotels are far above the rest. 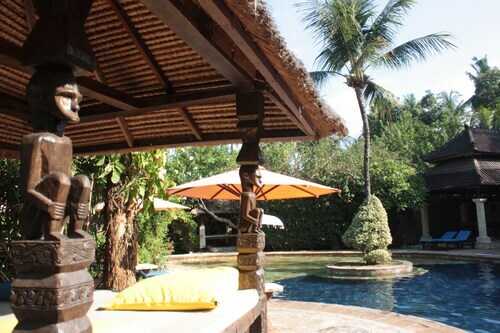 Take a look at the Dolphin Beach Bali, a kilometre away. If that's not what you're looking for, the Bali Paradise Hotel Boutique Resort & SPA is 0.9 kilometres away. Grab a tea or coffee at Akar Cafe (Jalan Binaria, Kalibubuk). It's only 0.2 kilometres from Lovina Beach. If you're after something more filling, order some food at Spice Beach Club Bali (Pantai Lovina, Jalan Singaraja-Seririt No. 225, Kaliasem). It's just 0.4 kilometres away. Dropping by to appreciate a monument like Lovina Beach Monument is a great way to develop an understanding of local history. Brahma Vihara Arama is a must-visit for travellers seeking to explore the roots of local culture. Banjar Hot Springs is a superb spot for people who like looking at intriguing natural creations. A few hours spent at Gedong Kertya Museum and Library is a good option on a rainy day. If you need to kill a few hours, view the exhibits at Museum Buleleng. How Much is a Hotel Room in Lovina Beach? 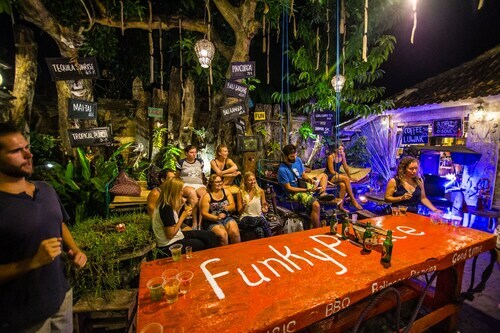 Hotels in Lovina Beach start at AU$20 per night. Prices and availability subject to change. Additional terms may apply. Private pool villa was delightful. Loved our stay. They went out of their way to get me gluten free bread from the local bakery. Delicious breakfast and great location. Small hotel right on the beach just a short walk up the beach to the main restaurant and shops. Stayed here before and will again. Staff are helpful and welcoming. I've been holidaying at Rambutan Cottages for thirty years. Every time I stay, I wish I could stay longer. I lose my stressed work life, my frustration with Bali's traffic jams, my connection to the outside world, and start to float away in the relaxed ambience of Rambutan's massages, pools, tropical gardens.